Last night when I was taking my usual shower, something strange happened. No, I didn’t have an epiphany on how to accomplish world peace. Nor did I compose a soon-to-be renowned symphony with my awesome mind power. No, I was just bathing myself. I felt… soapier than usual. I thought my body wash had started to rot. I don’t know if body wash can rot or not, but I’m telling you, this stuff was really slimy and weird-feeling on my skin. I thought MY BODY WASH HAD MALFUNCTIONED. So I slowly raised the loofah to my quivering nostrils and took a whiff. That’s what I smelled on my loofah. So apparently, in my sleep-deprived state, I slathered SHAMPOO onto it. Not the body wash that was sitting RIGHT IN FRONT OF ME. No, I lathered it up with SHAMPOO. Shampoo that’s in a bottle that doesn’t even remotely resemble the bottle of my body wash.
Nathan, of course, didn’t let us get much sleep last night either. The little guy has been bright-eyed and bushy-tailed since early this morning. I just laid him down for his nap, and I can hear him in his room talking to himself. Trying to be LIKE HIS MOMMY. “Nya nya nya nya! Oye Oye Oye! Rar MA MA!” he says. So I sneak through the hallway and peek my head into his room. He has kicked one sock off, dislodging it from his foot like water off sliding off rocks. Those naked toes are wrapped around one of the crib rails, clinging to it with a tenacity to be reckoned with. His other foot still has its sock on, so the sock-foot and his arms are flailing aimlessly in the air. Those arms flail around until one of them randomly strikes the base of his mobile, the part attached to the crib rails. Instantly, all his senses are awakened. He rolls over, still managing to keep his naked toes wrapped around the crib rail while draping the other leg over it. Like a human pretzel. He starts banging at the base of the mobile, fingers splayed, searching for buttons or lights or KNIVES or whatever baby fingers are looking for whenever they roam all over an object. Satisfied that he is okay, I slowly edge away from the doorway. I immediately pause in The Stance. 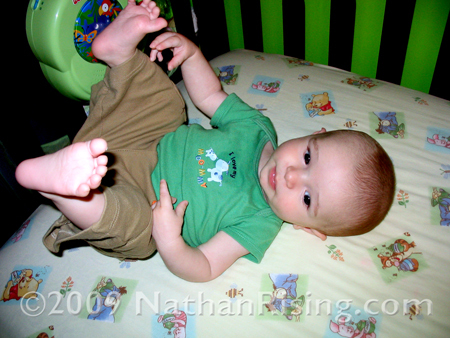 (I mentioned The Stance here, during one of Nathan’s naptime failures.) My heart thuds loudly in my chest. I wonder crazily if he has super-sonic hearing and can hear my thumping heart. Nathan’s searching fingers pause briefly over the surface of the mobile. He waits a few seconds, apparently waiting to see if there is any more creakage. Satisfied that the world has not come to an end behind his back, he finally continues exploring his new find. I continue to slowly back my way down the hallway, mindful to avoid the especially creaky parts of the floor. And now I sit here, listening to Nathan muttering to himself as I type this. He’s got to be tired. How can he not be tired? But alas, he is apparently not tired. Let’s hope he takes his nap. Not only for himself, but for me as well. Because mommies need naps, too. This entry was posted by Jen on November 19, 2009 at 5:05 pm, and is filed under Daily Life, Jen and Paul. Follow any responses to this post through RSS 2.0.You can skip to the end and leave a response. Pinging is currently not allowed. I’ve done that with hand soap in a pump. I’ll go wash my hands and realize that the watery soap ISN’T soap..it’s hand sanitzer. Hope he NAPPED for you!!!! .-= Nancy@ifevolutionworks.com´s last blog ..Don’t Pick Me for a Friend =-. He did, he napped today! For an hour!! Might not sound like much, but every minute counts around here! OMG. I totally know what you are talking about: the “creakage”, the “stance”. Only I didn’t have the wit to come up with names for these. Nap time is sacred! Yours and his! .-= submom´s last blog ..To Hell with keeping my mouth shut and ignoring the crazies and the ignorant… =-. I agree about nap time being sacred… now I’m just waiting for him to realize that as well! !